Posted by anfield in All, Liverpool FC. 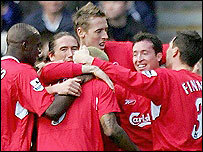 An efficent performance saw Liverpool beat WBA 2-0 at The Hawthorns Saturday evening. The best player on the pitch was arguably Xabi Alonso who played a major part in both goals. The first goal scored by Fowler after 6 minutes would of upset West Brom fans who felt Cisse handballed and then Fowler was offside. 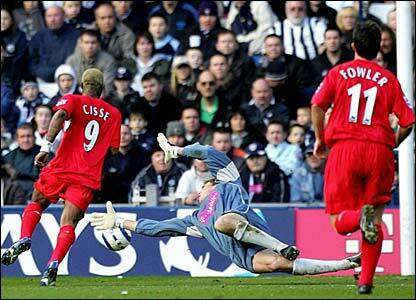 Cisse's handball certainly looked like a handball but it was a well worked goal. The second goal was route one as Alonso picked the ball up from Reina and hit a superb 60 yard pass towards Cisse who got away from the defence and the goalkeeper to hit it into an open net and make it 2-0 and surely make the game safe. Safe it was, WBA came back and looked like scoring but for good defending and keeping. The win puts Liverpool onto 67 points and should mean we finish 3rd come the end of the season. A good season if we achieve this in my opinion with the FA Cup still to go. Posted by anfield in All, World Cup 2006. Posted by anfield in All, England. Various players including Michael Owen, David Beckham and Paul Robinson have made their comments about whether they want an English manager or a foreign manager when Sven Goran Eriksson leaves the England post after the World Cup this summer. Me personally? I don't really mind his nationality. 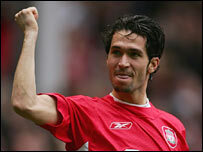 I wanted Sven to go due to the stories about him (maybe they weren't true). He's done well for England competitively, Northern Ireland one of the few defeats with Brazil and Portugal. I can see why people want an English manager, and I think it would be better if he was English. However there are few who would be good enough to take over. When the news first broke out, of the favourites I wanted Guss Hiddink who has international experience. However it looks unlikely now, with Fabio Capello saying it would be a dream to manage England, I am sure many English people would dream of having him in charge. 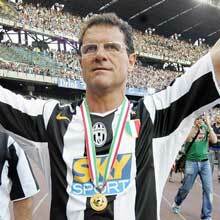 Few would decline Capello the role whether he be English, Italian or any other nationality. What better a way to start this blog then to use a victory in the Merseyside Derby, as eventful as usual!! Within 18 minutes captain Steven Gerrard managed to see red after 2 bookings, the first of which maybe seen as harsh but few could argue with the second yellow. However Liverpool showed great sprit and arguably played better after Gerrard was sent off, with Xabi Alonso playing a blinder in the middle with Gerrard's absence. Who better to score an Own goal for Everton then Phil Neville when the breakthrough did come though, and at a great time just before half time. Shortly after the break Luis Garcia then put Liverpool 2-0 up and at this point I thought we were crusing to victory, but Cahill scored from a corner with Everton proving less then dangerous before then, leaving for an exciting finish. However when Andy Van Der Meyde got a red Liverpool seemed favourites for all 3 points but Harry Kewell sealed them all with a superb strike near the end to win the game for Liverpool! Posted by anfield in All, General. Hey all, heard about Word Press and decided to start an account on here. Not sure how often this will be updated but I hope to update it fairly regularly. Although it's called Anfield's World of the Reds (Liverpool FC) I intend to have lots of other stuff not related to Liverpool as well!